This luxury detached villa with its own secured, private swimming pool is set in a beautiful location in the middle of the Esterel Mountains. Enjoy your first cup of morning coffee on the terrace with stunning views over the hills, with behind the bay of the fashionable Cannes. This villa is equipped with every comfort and luxury. The entire villa is air conditioned. The four bedrooms have all very comfortable beds and an adjacent private bathroom. From every room you step right onto the terrace via the French doors, where luxury loungers around the pool invite you for a siesta. In the evening you can enjoy the sunset while the Weber grill is doing its job for a nice dinner on the terrace. In the vicinity there are plenty or things to do. 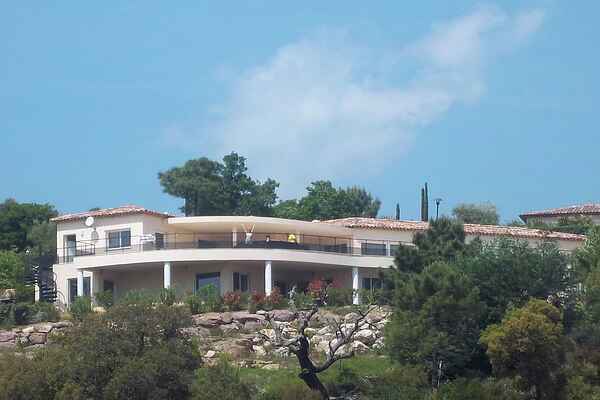 Les Adrets-de-l'Esterel is located in the beautiful nature and is just 20 minutes from the Cote d'Azur. A visit to the artists' village of Mougins, or the Picasso Museum in Antibes is certainly worthwhile. A ride along the coast with the coastal resorts of Théoule-sur-Mer and Mandelieu offers beautiful views. * For rentals of 2 weeks or more, there will be a weekly cleaning on Saturday. The cost of 100 euros must be paid to the villa manager. * At arrival, a nice bottle of red, white, rosé wine and mineral water are waiting for you in the fridge. * Nespresso coffee capsules also are ready for use.